Ok, ALL dads are special! 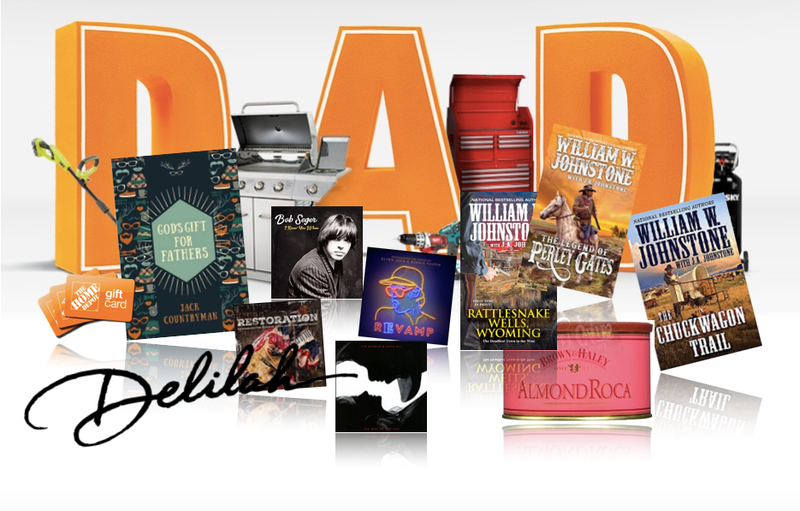 But earlier this month, I shared some gift ideas for the dad (or dads) in your life. I also promised to give away two bundles of every item I'd recommended; all you had to do is write to me and tell me about the man that brings inspiration and honor to the title "Father." Your responses came flooding in and wow, are there some amazing men out there! I so love to read your stories! I'm going to share two of them with you and I bet you'll agree that the gift bundles they will receive in the mail are well deserved. My husband, John, was not raised with a Dad. His parent divorced when he was an infant. Bad blood, meddling grandparents, and selfish thoughts (on both sides) kept him from having a relationship with his father. Growing up, he had his grandfather as a male role model. Unfortunately, his grandfather left the family when John was 10, again plunging him into the “fatherless” role. Growing up, he wasn’t able to participate in the traditional father-son activities: father-son cake bake in Cub Scouts, Dad & me events, fishing on the lake, playing catch in the backyard, teaching him how to fight off bullies, showing him how to defend himself, how to tie a tie... the list goes on. Flash forward: A little over nine years ago, after five years of marriage, countless negative results-I’m pregnant. John bounced from feelings of elation right down to bone chilling fear. His biggest fear? He didn’t know how to be a father. He. Didn’t. Know. How. To. Be. A. Father. What did he have to look to? How was he going to show his daughter or son what a father looks like, when he didn’t know himself? This man wept when he was finally able to look into the eyes of his son. He was overcome by a sense of the need to protect this innocent baby who was securely tucked into his arms. He proudly proclaimed to everyone that he was a father of a baby boy. Within the past eight years, he’s shown our son what it means to be a father. He’s present EVERY SINGLE DAY! He’s participating in all of the activities that he missed out on, with our son. Important life lessons, philosophical discussions, silly notions, and life’s quandaries are discussed around the workbench as they build their latest project. Sometimes, if you can catch him in just the right moment... you can see that lost little boy within my husband’s eyes and catch him smiling. For those moments, I am grateful. Wow, what a powerful message! This man was determined to set a different course for himself and his child. I am so very proud of him, and all men who make the same choice to be a strong, unwavering presence in their children's lives! Please pass along a high five Shelby! I am writing to you about my dad, Henry. I am one of 8 children. Yes I said eight! Four from birth and four born from the heart. Never was there a hesitant moment when my parents thought they couldn't take in another child from foster care that needed a home. My dad was always the one saying, "Let's do it. " My dad took on two jobs for a bit to help cover expenses of so many children. He worked hard keeping the family afloat. Now I'm almost 40 and he is retired, yet he is still working so hard. He helps take care of my sister's children while my mom is at work, (she is a paraprofessional at a charter school in northern Michigan and has been doing it for 20 years or more.) He helps build props and sets at the school for no pay. He also plays in the church band every Sunday, participates in men's group, and sings for specials. This past couple of weeks my father decided to use some of the money they had saved for renovations to create a fun outdoor area for the grandkids. He moved the fence to make the yard bigger, hand built the gate so his riding lawnmower would fit, set up new play areas and built a teeter-totter. He is so hand around the home and loves to do wood working and activities to make others happy. I just believe he is the most deserving father ever. I love him so! Thank YOU, Erin, for telling us about this Super Dad. Taking on eight kids is not for the faint of heart (props to your mamma as well!) It sounds to me like your dad has discovered the secret to a happy life; loving unconditionally, keeping busy, and giving back. Please give him my love and thanks for a job superbly done! Enjoy your gift bundles fellas - there are great books, music, candy, and gift cards all packed up for you. And now that you've read these, dear visitors, perhaps you understand why I ask you to write to me! There are millions of amazing stories out there that delight and inspire. I want to hear them all! Please share yours with me too! Drop something in my mailbox D@Delilah.com.